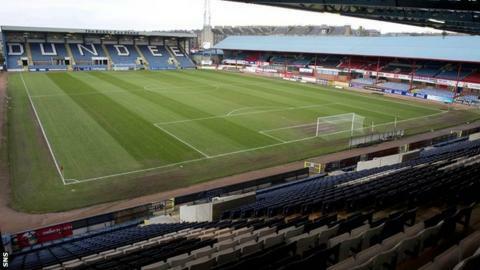 Dundee have interviewed three candidates for the managerial vacancy at Dens Park. Directors intend to conduct interviews in the coming weeks to appoint a permanent manager. And the board have not ruled out the possibility of the interim appointee being given the job on a permanent basis. Ray Farnigham, who was Smith's assistant, has been placed in caretaker charge of the team. Speaking to BBC Scotland's Sportsound programme, Calderwood said: "It's a fantastic club and probably after the top five - the two Glasgow teams, the Edinburgh teams and Aberdeen - they are the next biggest team in Scotland, potential wise. "They have a fantastic support. I remember being at Ross County when they were trying to stay in the league and they must have taken 2,500 fans up there. It was unbelievable." However, former Dundee player and assistant manager Billy Dodds is "quite surprised" to have been linked with the vacancy. "I have not applied for the Dundee job at all," said Dodds, who left the assistant's post shortly after the club went into administration in 2010. "I didn't leave in the best circumstances but I love the club and they have a fantastic set of fans. "The fans deserve a little bit better. I don't think there has been stability at that club for a number of years. "I was there as a young boy as a player and I have seen all the characters come and go at boardroom level. "It's nice to get a bit of stability and maybe get a manager there that's going to be long term." You can follow Jim Spence on Twitter.